Despite a string of critically acclaimed albums and an exceptionally dedicated fan base, progressive metal trio King's X has never managed to find mainstream success. 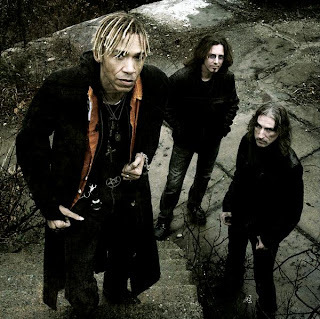 Bassist and vocalist Doug Pinnick says that's OK with him, though. "It was disappointing in the past, but now I realize I've lived a life of dreams," said Pinnick. "We're still here, and we're still respected. Hopefully, we'll be here forever, and you can't say that about a lot of bands." When King's X first hit the scene in 1988, they were very different from the bumper crop of hard rock acts that were climbing the charts. Their music was more complex, mingling elements of hard rock, funk, soul and R&B with smooth, Beatles-esque vocal harmonies. For Pinnick, who classifies himself as a "person who has always been on the outside," being different was nothing new. When King's X formed, there weren't a lot of black musicians playing hard rock and metal. "In my high school years, I lived in the ghetto with my mother, and people would say, `Why are you playing that white boy music?'" he said. "But I always had Jimi Hendrix and Sly and the Family Stone to tell me it was OK."
Then, a couple of years ago, Pinnick admitted his homosexuality in an interview. For a few fans, particularly those who were attracted to the Christian overtones in much of King's X's music, it was hard to take. But Pinnick said most fans stood by him. "The Christian fans don't accept it, but they say they still love me - and I've gotten a few hate letters from gay-bashers," he said. "But an overwhelming majority - almost all - of the King's X fans have e-mailed me and said they don't care. They're just proud I can stand up for myself and be honest, which is what they've always expected from me." Those fans are one thing that has kept King's X going through nine albums and nearly 15 years. Pinnick said while their fan base may be smaller than some other bands, it's very passionate about King's X's music. "Our family of King's X fans aren't the average hard rockers," he said. "I think that's why they stay forever. It's almost like they're addicted to it." The fans have responded well on the band's first two trips through the U.S. in support of their 2001 release "Manic Moonlight." In the King's X tradition, the album is a bit different from their previous releases. Searching for inspiration, they used drum loops and some electronic sounds for the first time. Pinnick said fans are divided on the new sound. "They're split pretty much down the middle," he said. "They either hated it or loved it, and very adamantly, too. They let us know what they thought." Though the band is known for mixing things up, Pinnick said it's not intentional. "It seems that most of our albums are different from the last one, and I have no idea why that happens," he said. "We just play our music and pour our hearts into it." Pinnick said "Manic Moonlight" is his favorite King's X album so far, largely because it was a new experience for him. After the songs were written, he put down his bass and vocal tracks and then went on tour with his side project Poundhound. That left the rest of the production to bandmates Ty Tabor and Jerry Gaskill. Pinnick says it's like being able to hear something completely new from his own band. "I just love the songs," he said. "I like it because I disassociated myself from it a little." More recognition may be on the way for the band. They recently learned they'll be hitting the road with guitar maestro Joe Satriani and fellow prog-rockers Dream Theater at the end of the summer. To many, the pairing seems a match made in heaven, but Pinnick said he doesn't see much similarity. "I don't think we have anything in common with the other bands, except that we all like complex music. But everyone feels this is something we need to do together," he said. "It's going to be fun. We're only playing for half an hour, but we get to play first and try to win a few new fans." Beyond that, King's X will continue to tour relentlessly and make new music. "We will continue to do this until something stops us," Pinnick said.